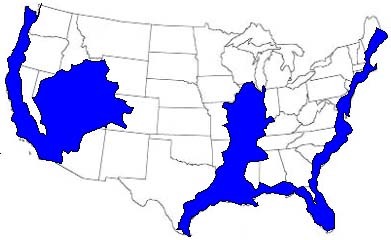 Here is a map which has been attributed to -- (1) a turn of the (last) century 'revelation' dream of the future; (2) a prediction by Edgar Cayce; and (3) the U.S. Navy based on rising water levels and potential earthquake zones. I mean, it does make sense if the water levels rise due to global warming -- the Eastern and Western coastlines would be under water (( and so would most of the high population / high tech zones )). AND, if it floods into Southern California, it can slip right around and flood the VERY flat, below sea level regions in Nevada and Utah... and even slip up to the mid-mountain ranges in Colorado. The major flood zone from the Gulf up nearly to Michigan is due to flood history of the Mississippi River -AND- the potential of earthquake 'settling' along the New Madrid Fault zone which slips along the river. In the 1800s, it had a 7.5 quake with over 2,000 after shocks... some as high as an 8... and created a few lakes due to 'land dropping'. So, not so unrealistic. All that said, it does tend to narrow down where one might 'migrate' to -- just in case. Last Edit: 6 years 4 months ago by Kol Drake. I think the science is more refined than this now, so this would be considered a worst case scenario. Also, the affects of sea level rise aren't a constant amount everywhere. The currents make a difference. So the gulf coast is affected less, including florida, but getting farther up the east coast around virginia and north will get more because of the way the currents are changing. That's why I mentioned to Phoenix to start making plans to leave now so when he's ready it's not too late. Also, there's more than one reason why I'm leaving Houston as soon as I can. I really don't have a need to be here for the changes as they come. I'll gladly settle in Colorado for a while. There are still channels predicting a very large quake for California very soon. As in this year yet. And the Madrid fault could go in the next few years. California is around a 90% probability at this point. Madrid is farther down the line so closer to 50% probability. But sea level rise is already happening and will accelerate quickly. I hear 2-3 years, which isn't much time at all to prepare. In the meantime, storms on the coasts will do more damage. Most people here don't live on the coast, but those that do need to be prepared. Memnoich replied the topic: Different Post-Apoc. Strategies? You know, it all depends on the situation, for example, I live in what is known as the Western Slope of Colorado. By Kol's map, I'd have beach front property, but that's only if the polar ice caps melting, causing the sea level to raise, doesn't cause the Earths crust to shift on the mantle, as has been predicted should the ice caps melt to far, putting the Great Lakes as the new North Pole, making Colorado inside the polar circle. But then again, there are the extinct Volcano's known as the Grand Mesa, if i remember correctly it's made of three of them, that could potentially reactivate, making most of south and west Colorado uninhabitable. So I mean, for the most part, I'm good to go should something happen, I know where to run, I have my supplies, and if needed, I actually have several places to go, depending on what happens. Maybe it's from my days in S. Korea, and knowing I'd have a life expectancy of 10 seconds should something happen, but I've always made sure I had a plan. Touches on 'going out of cities'; using solar panels; learning basic farming & blacksmithing; making glass. Jax replied the topic: Re:Different Post-Apoc. Strategies? Perhaps i should start a thread on solar given that's my business now.